This set of toy train plans is inspired by sketches that I found on the internet. 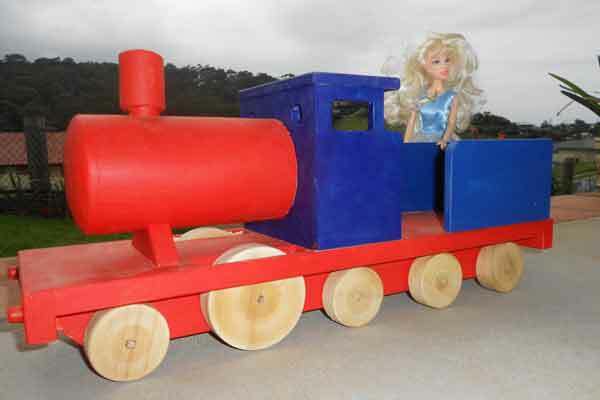 Barbie dolls and wooden toy trains don't normally go together, but I was trying to show the scale of the toy. First published in The Woodworker in 1943, the original is big enough for a small child to ride on. Measuring 34 inches long, 7 inches wide and about 13 inches high, I thought is was just a little too big for my liking, so I decided to make a smaller version. This scaled down version is about one third of the size of the original toy train plans at only 40 inches long and about 4 inches high, it is still a substantial toy. There are several reasons why I decided to make this project. One of them was the way the boiler was made, cooper style, which is to say the way beer barrels were made, you know, out of wood, in the old days. If you have access to a lathe, making the boiler should be a lot easier than the way I made mine with a finishing plane. It does require a bit of patience and persistence, but it is worth it in the end. Designed to use project timber available at your favourite hardware store, this project can be built with basic woodworking tools that most people already have. Click to download free print ready PDF files. It contains the plans and construction notes that you need for this project. This is a summary of the construction notes. The boiler is made by gluing six strips of wood to form a hexagonal shape. A shallow hole is drilled to fit the smokestack. A paper disc is glued on to each end to help to plane it round. It would be a lot easier to do this step if you had access to a lathe. The dome shape on the front of the boiler is carved and sanded smooth. The holes for the set of small wheels is drilled. The photo shows how to mark the holes for the large wheels. Cut out the clearance slots for the large wheel. Glue the frame to the base, and fix the buffers in place. Because the boiler is hollow, it would be a shame to seal it off forever. Even the novelty of placing a marble inside would wear off pretty soon, and drive everyone crazy. There had to be a way to make a set of doors somewhere, somehow. 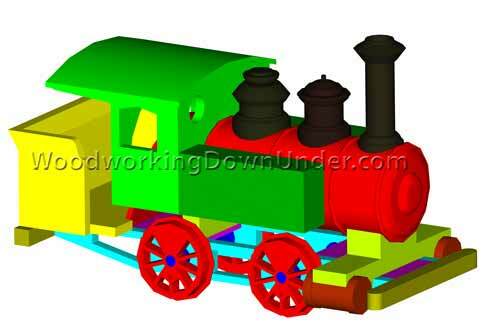 Real steam trains have access from both ends, and for this toy, making a hinged door in the front would be far to delicate, not too mention complicated. So, after much contemplation and a good nights rest, I decided to make a set of rotating fire doors as shown in the photo. Best to paint the doors and the inside of the cab prior to assembly because the paint will effectively glue the doors shut. The toy is complete and ready for painting in colours of your choice. It's best to remove the wheels and fix them in place once the paint has dried. 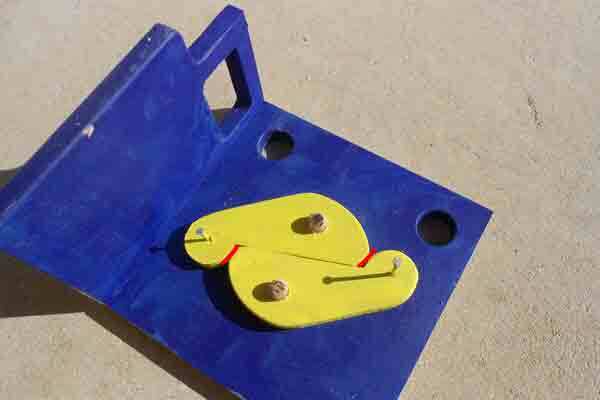 Make a set of plastic plastic washers using a hollow punch to stop the wheels rubbing on the sides. 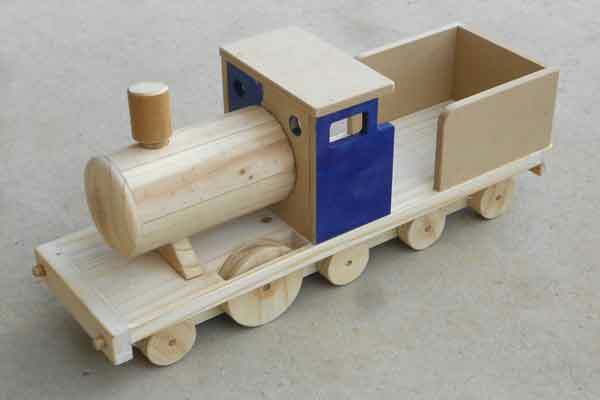 Model of a 19th Century Switching Engine inspired by plans by Alfred D. Slater. Download includes a Sketchup animation sequence. 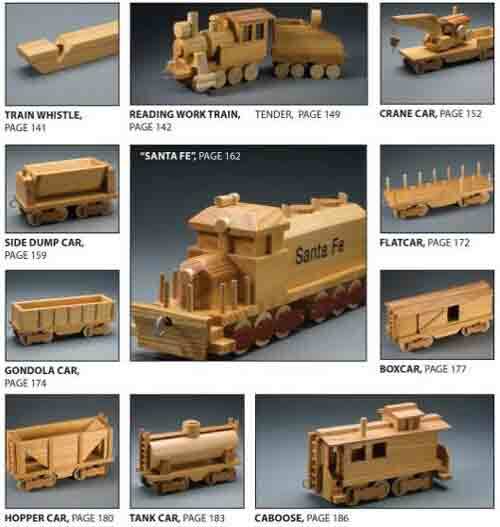 More toy train plans included in books on toymakers wooden vehicles from well known authors such as Norm Marshall and Ralph S. Buckland.